I received a few new cookbooks this holiday season, including Jerusalem, Heart of the Artichoke, Bean by Bean, and Jeni's Splendid Ice Cream at Home. I've already had a chance to try a couple recipes from these books and I can't wait to try more. No matter how many recipes I make, there's always so many more creative ideas out there that I have to try. But before I get to recipes from my new books, I want to share this one from The Smitten Kitchen Cookbook. 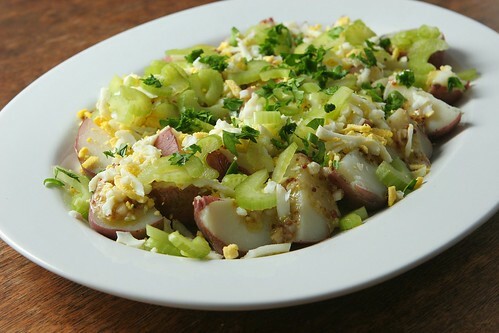 This potato salad has pickled celery, grated hard-boiled eggs, and a mustardy dressing. If you're a pickle lover like me and prefer your potato salads mayo-free, this is something you should definitely try. Wishing you all a happy and healthy 2013! First, pickle the celery. Whisk together the vinegar, water, salt, and sugar in a small bowl until well combined. Add the celery and refrigerate mixture for about an hour. Halve or quarter the potatoes (depending on their size) and arrange them on a platter. Whisk together vinaigrette ingredients and drizzle over the potatoes. Grate the hard-boiled eggs with the large holes on a box grater and sprinkle over the salad. Top with pickled celery, parsley, and bacon, if using. ooh, this is one that i might have looked over! i'll definitely have to give it a try as i am always light on the mayo ;) happy new year! can't wait to see what you cook up this year! The pickled celery is definitely my favorite part of this! I love pickles. Happy New Year! What a great take on potato salad. Deb can do no wrong! I really do need this cookbook. Happy New Year! I wonder if I would like celery more after pickling it. Hmmm...only one way to find out!